New York, NY – I EXIST, an exhibition of art celebrating the work of Los Angeles-based artist SEEROON YERETZIAN, will be on display at the NATIONAL ASSOCIATION OF WOMEN ARTISTS’ Art Gallery at 80 Fifth Avenue, Suite 1405, New York, NY 10011. The exhibit will run from MARCH 5 to MARCH 27, 2015. Gallery hours are Tuesday through Friday, 10:00 a.m. to 5:00 p.m. 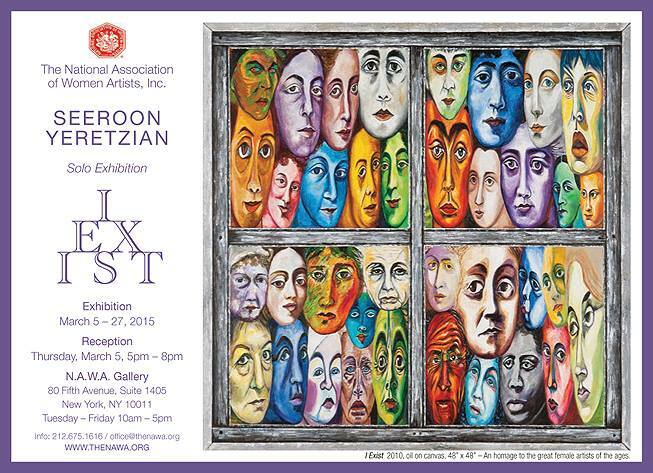 The artist will be present at the opening reception on THURSDAY, MARCH 5, from 5:00 p.m. to 8:00 p.m.
SEEROON YERETZIAN is an accomplished artist with diverse talents in painting, sculpture, and illustration. Born in 1951 at the Tiro refugee camp in Beirut, Lebanon, Seeroon was exposed to both the beauty and suffering of the world. This dichotomy has emerged in her work in what she calls her “Sunshine” and “Moonshine” art. The “Sunshine” pieces are rich in color, showcasing many life-giving earthly elements and produced during daytime. Conversely, the “Moonshine” pieces reflect themes based on personal experiences ranging from the Armenian Genocide to homelessness and self identity. Recognized for reviving the art of prehistoric Armenian petroglyphs and medieval Armenian ornamental art, her masterpieces include the elaborate “Four Seasons” and her 17 alphabets of different languages executed in the tradition and style of the Armenian ornate initials. Seeroon received her Bachelor’s Degree in Fine Arts in 1985 from the Otis-Parsons Art Institute and School of Design. She has authored three books, her self titled art book, Seeroon Yeretzian, her book of poetry, Word Weaving & Black Seat Confessions, and her best-seller, Seeroon Darer: Armenian Ornate Initials. This book recently served as the artistic inspiration for the design of the Armenian American Rose Float Association’s award winning float in the 126th Annual Rose Parade, entitled, Cradle of Civilization. In 2014, the City of Glendale, California, bestowed upon her its “Lifetime Achievement Award” for the arts. Although she was diagnosed with Lou Gehrig’s disease in 2012, Seeroon continues to create to this day. She has exhibited in numerous solo and group shows and her art is found in private collections and major institutions. The Association fosters public awareness of, and interest in, visual art created by women in the United States . The Association promotes culture and education in the visual arts through exhibitions of its members’ works, educational programs, scholarships, awards, its historical archive, and other appropriate means. While encouraging contemporary art and emerging artists, the Association honors and continues the long and important contribution of women to the history of American culture and art. Presented by National Association of Women Artists (N.A.W.A. ).